Calling architects, engineers, fabricators, consultants, and other design professionals: don’t miss your opportunity to join the industry’s leading innovators in our series of hands-on technology workshops and in-depth dialog workshops, only at the premiere conference for high-performance building envelopes – Facades+ PERFORMANCE Chicago, October 24th-25th! Register today to take advantage of our Early Bird Special and be ready to get your hands dirty with the latest tools and techniques that are changing the face of contemporary architecture. Join Jonathan Schumacher and Mostapha Roudsari of Thornton Tomasetti, Nathan Miller of CASE Design, Ronnie Parsons of Mode Lab, and other industry professionals for our full-day tech workshops, and gain the valuable skills necessary to deliver cutting-edge facades in today’s dynamic architectural landscape. Registered architects can earn 8 AIA LU credits as they catch up on the ever-evolving tools of the trade in the Mies van der Rohe-designed Illinois Institute of Technology’s Main Campus in Chicago, so don’t miss out! Following the series of stimulating presentations and lectures on day one of the conference, attendees will have the chance to choose from either two seminar-style dialog workshops or one of six daylong tech workshops, presented in conjunction with Mode Collective. In small, one-on-one, classroom settings, participants will gain the knowledge and skills to work with the latest in cutting edge design and analysis technologies to push your practice’s facades to the highest standards of performance. Learn the mechanisms for creating performance-based parametric systems and dynamic patterning with Grasshopper. Explore emerging techniques for the rationalitazion of envelope surfaces and the fundamental concepts of facade panelization and optimization with Galapagos and Kangaroo. Develop new skills for generating facade geometry, utilizing analysis information and managing complex parameters with Dynamo. Gain hands-on experience in the most up-to-date environmental analysis technologies to discover the next generation of high-performance building envelope design. All of this and more, more, more make AN and Enclos' Facades+ PERFORMANCE Chicago the event of the season for groundbreaking facade technologies. Our Early Bird special ends today, so sign up now to take advantage of this great deal. See you in Chicago! Re:site and Metalab's site-specific installation for Texas A&M's 12th Man Memorial Student Center uses 4,000 networked LEDs to create an animated display that speaks to tradition as well as to the future. The Corps of Cadets. Kyle Field. The 12th Man. Reveille. Texas A&M has more than a few strong traditions, most of which are centered around and given expression by the university’s football games and its alumni’s illustrious history of military service. At the same time, the school is well known for its robust and forward thinking science and engineering departments. Both of these characteristics factored into the conception for a permanent sculpture to inhabit A&M’s new Memorial Student Center (MSC). Created by art collaborative RE:site and design and fabrication studio Metalab (both located in Houston) the sculpture, titled Memory Cloud, is a chandelier of 4,000 white LEDs that are animated by two distinct feeds: one derived from archival footage of the Fightin’ Texas Aggie Band, the other from live infrared cameras that monitor people passing through the center’s atrium. “To interpret tradition visually we thought of moving patterns of people,” said Norman Lee of RE:site. “A&M has a strong marching band. If you remove the specifics of what the band is wearing and focus on the movements, they’re the same from 1900 to now. Once you reduce the figures from archival footage to silhouette patterns, you can’t identify the different points in time. Time and space collapse and bring together the school’s tradition in visual terms.” The archival silhouettes interlace with silhouettes from the live feed, generating ambiguous patterns that take time to sink in. “We envisioned incoming freshmen seeing the shadows and after three or four weeks realizing what the figures are in a powerful ‘ah ha’ moment,” said Lee. Memory Cloud is composed of a 14-foot-wide by 21-foot-long diagrid 1/8-inch powder-coated carbon steel frame and 220 LED arrays housed in clear acrylic tubes that hang in 21 rows from 16 gauge aluminum raceways carrying the data cables and electronics. The arrays are between 9 and 13 feet long and end in acrylic disks that are angled to give a billowing profile to the bottom of the sculpture. The disks also act as luminaires, picking up and diffusing the light of the lowest LED node via fiber optic effect. The piece is suspended from one point on the ceiling with a cable rigging. A winch can raise or lower it for maintenance. RE:site and Metalab used Rhino and Grasshopper to model Memory Cloud’s geometry as well as to develop quantitative data sets for the lighting purchase orders and assembly inventories. The diagrid structure was developed by Houston-based structural engineering firm Insight Structures using finite element analysis (FEA) software that determined a varying depth of profile to deliver the necessary support within the weight requirement. “We had a weight limit of 3,000 pounds,” said Andrew Vrana of Metalab. “At first we wanted to use 3/16 aluminum, which is light weight, but it deformed too much under welding. So we went with carbon steel and by optimizing the profile wound up with a final weight of 2,400 pounds.” The team also used the Lunchbox plugin for Grasshopper, which was developed by Nathan Miller of CASE, which helped to create clean data structures that retained their organization as the geometry of the cloud was refined. To create and program the LED matrix, RE:site and Metalab worked with Digital Media Designs (DMD), which did the digital lighting display for the 2008 Summer Olympics in Beijing. The company worked with a Chinese manufacturer to develop a custom LED product capable of meeting the sculpture’s size requirements while functioning within a broad range of daylight conditions. It also had to create a DMX control system that would take RE:site’s 2D silhouettes and replicate them in Memory Cloud’s 3D LED matrix, an unprecedented task from a software point of view. DMD worked with UK company Avolites Media to customize their AI software to this purpose. “With that software we were able to utilize a method called pixel mapping and find a way to interpret RGB values into black and white and also to transpose that into XYZ coordinates, creating a 3D virtual cloud,” said Scott Chmielewski of DMD. Memory Cloud was prototyped and fabricated in Houston, then trucked the 100 miles to College Station. The on-site assembly and erection process took 10 days to complete. Gig ‘em Aggies! Cast stone and steel become the medium for collaboration at Trahan Architects’ newest project. Trahan Architects’ Louisiana State Sports Hall Of Fame and Regional History Museum was designed with northern Louisiana’s geography in mind. Located in Natchitoches, the oldest settlement in the Louisiana Purchase, the 28,000-square-foot building overlooks Cane River Lake at the boundary of the Red River Valley. 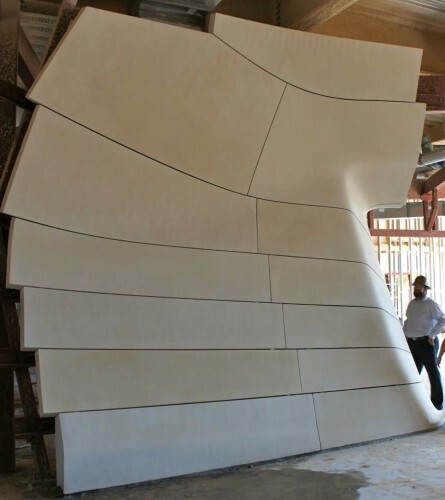 While the museum’s exterior will be clad in a skin of cypress planks, a nod to the area’s timber-rich building stock, the interior spaces will be formed by a skin of more than 1,000 cast stone panels resembling land shaped by eons of moving water. As the panels begin to be installed, AN went behind the scenes to learn how the project is taking shape.